Firstly, I apologize to the… 5 people who read this blog for the half-year hiatus. As usual, I blame life – things have been quite hectic these past few months, forcing me to put the brakes on blogging yet again. So what has finally inspired me to come out of blogging hibernation? As you’ve probably already noticed, I love food. Really, huge fan of the stuff. Now, although my sister is the chef in the family, cooking is something that all the women in my family enjoy doing, and I am certainly no exception. 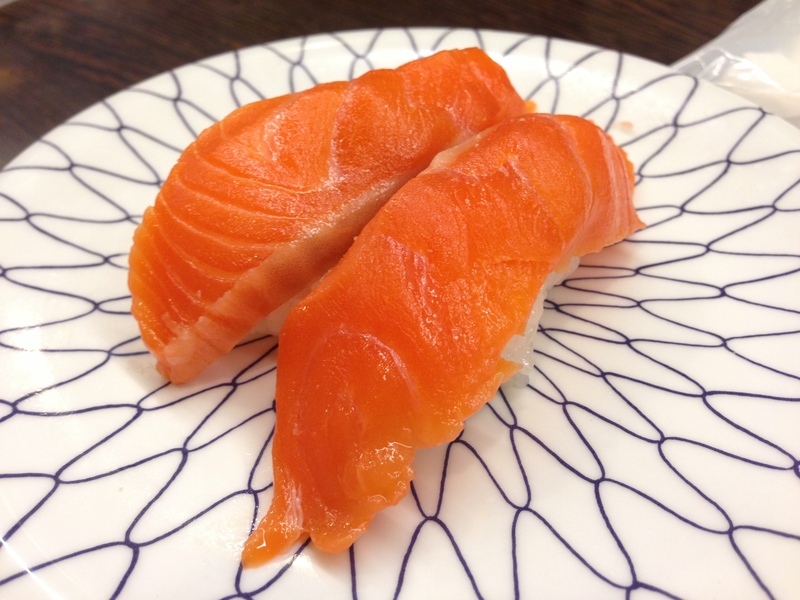 Always eager to learn new recipes and techniques, I decided that I would try to go about learning how to create Japan’s most famous culinary export – sushi. To that end, I was quite delighted to learn about Yuka Mazda. Yuka is a Japanese home cook who has been teaching cooking for over 20 years. After a stint living in the UK, she began giving lessons in Western cuisine to Japanese people upon her return to her home country. Eventually, she also started offering Japanese cooking lessons to foreigners out of her home kitchen. I first meet Yuka at Hiroo Station, where two other students are also waiting. Together, we walk over to Yuka’s apartment – quite spacious, for Tokyo standards – and enter to find a table laid out with various types of fish, vegetables, mirin, komezu (rice vinegar), pickles, and everything else we would need to prepare our Japanese meal. “I don’t like to spend too much time explaining things, because then you’ll get bored,” she begins, with a slight British inflection. Instead, she would prefer we learn by getting our hands dirty and diving right in. And dive in, we do. 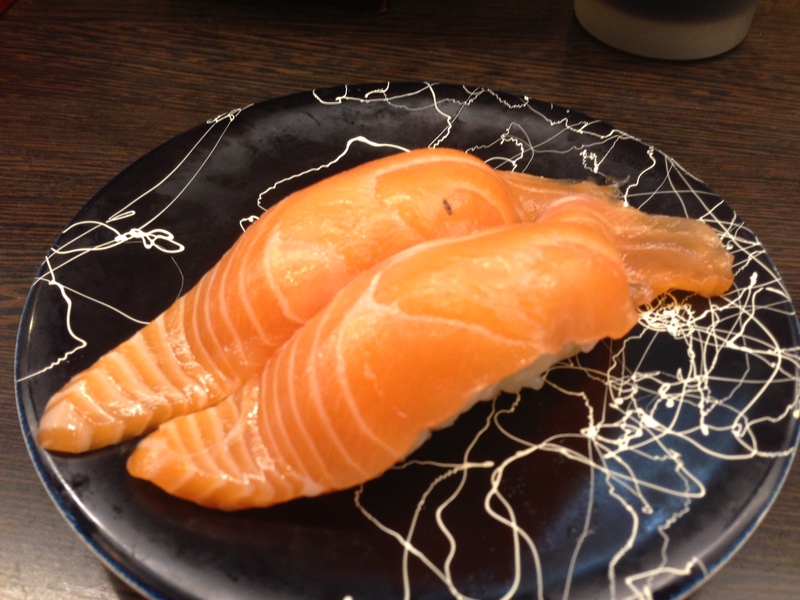 Yuka begins each step of the process by demonstrating what needs to be done, and then we each take turns cutting maguro and salmon, deveining ebi, seasoning rice, preparing several makizushi, nigirizushi, and even the Western-style uramaki. It’s a veritable sushi-making boot camp, albeit an enjoyable one. And after assembling one roll after another, it’s hard not to get the hang of it. Since there are only three of us in the class, we each get a lot of attention from Yuka. She’s quick to correct mistakes, although she doesn’t hover too much — she gives us a chance to try things for ourselves. The results from a morning of sushi-making. Throughout the class, Yuka is clear in pointing out what is traditional and non-traditional, as well as some background information on the ingredients themselves, but also encourages us to take these newly learned techniques and make our own creations, incorporating ingredients from our home countries. Before the class is concluded, Yuka prepares the table with nihonshu (sake), as well the tofu, miso soup and sushi we prepared during the class. Even if you’re a klutz in the kitchen, I highly recommend taking a class with Yuka. 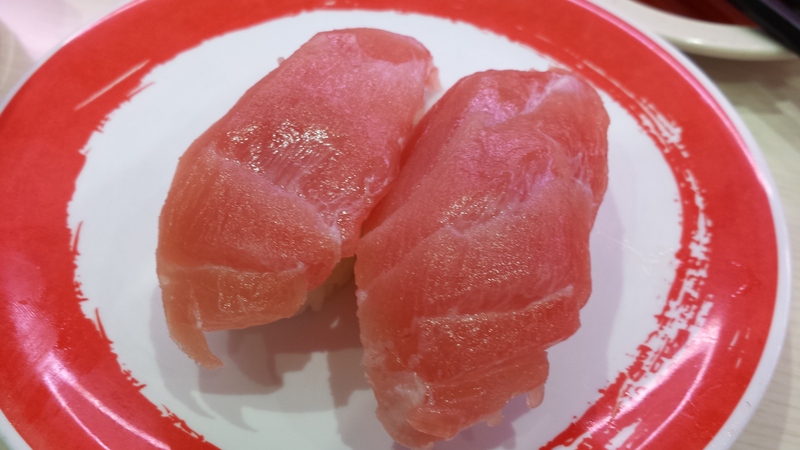 (In fact, I enjoyed it so much that I ended up returning recently with my mother-in-law who also wanted to learn how to make sushi, although this time, I opted for the daifuku course). You’ll learn a new skill, and at the very least, gain a greater appreciation for the sushi that you scarf down at your local kaitenzushi. 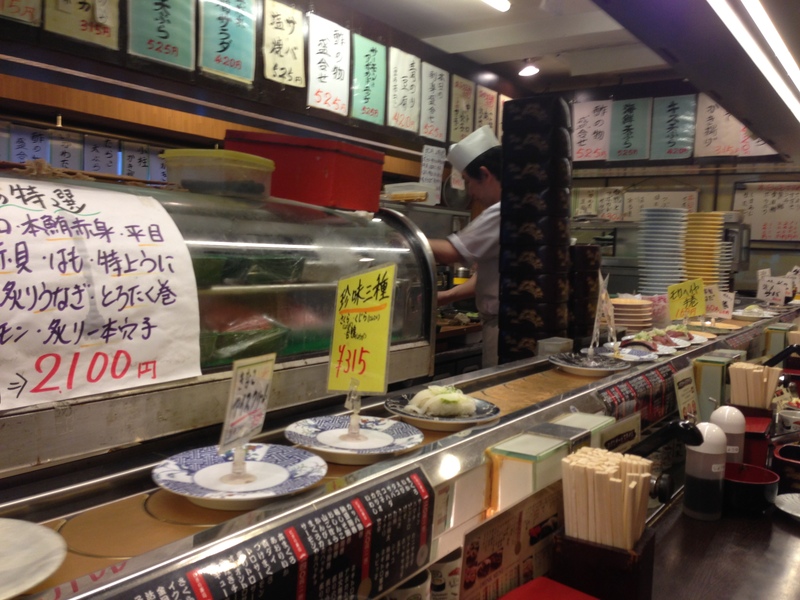 Kaiten zushi is sushi given the fast food treatment; also known as conveyor belt sushi by English-speakers, it’s sushi done cheap, quick and — most importantly — delicious. 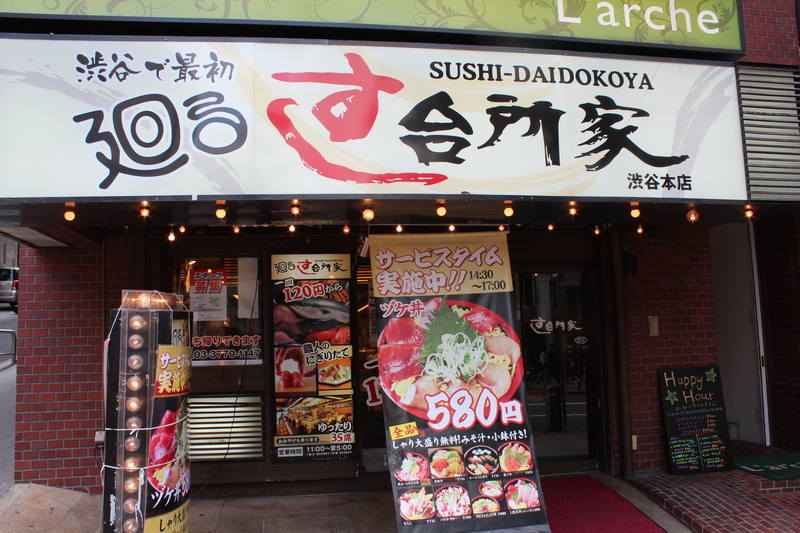 Both Edu and I love sushi, and so our first weekend in Tokyo, we stopped at Sushi-Daidokoya to have our first kaiten zushi experience. 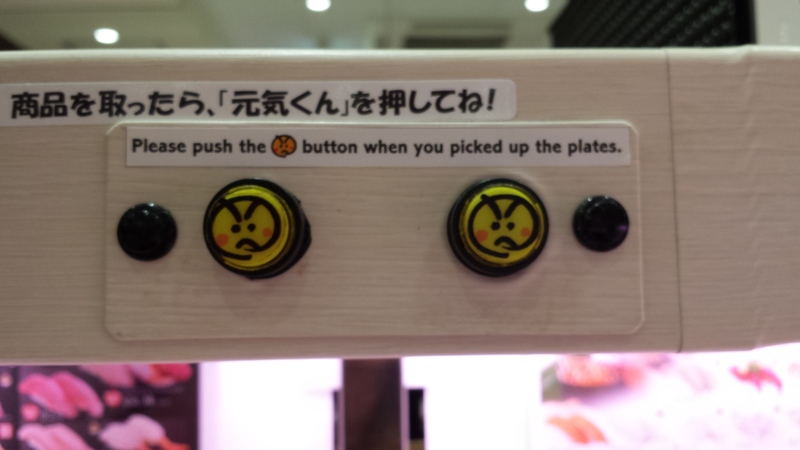 It works pretty similarly to other conveyor belt sushi joints — you can place your order with one of the servers, who then calls them out to the chefs behind the bar. Or you can just grab items off of the conveyor belt as they pass in front of you. Once you’ve cleaned them off, you can stack your plates, which are colour-coded depending on the price of the item. At the end of your meal, the server determines how much to charge you based on the quantity and colour of your empty dishes. I totally meant to take more pictures than this, but the food was too good and I’m too impatient. 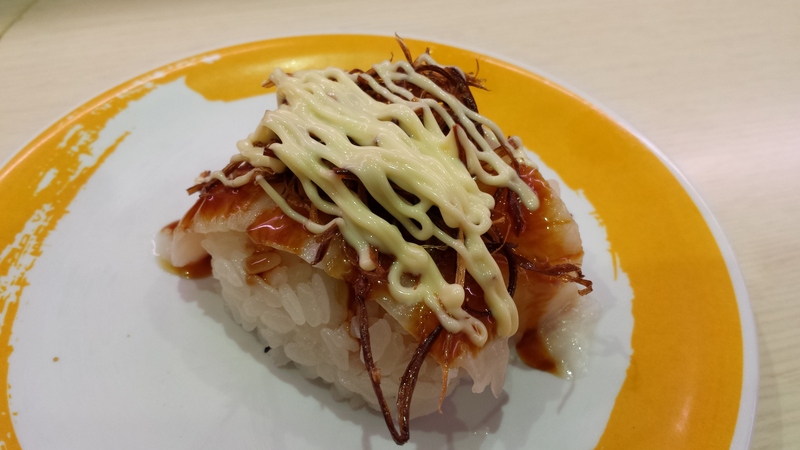 The second kaiten zushi restaurant we checked out was the slightly more modern Genki Sushi. 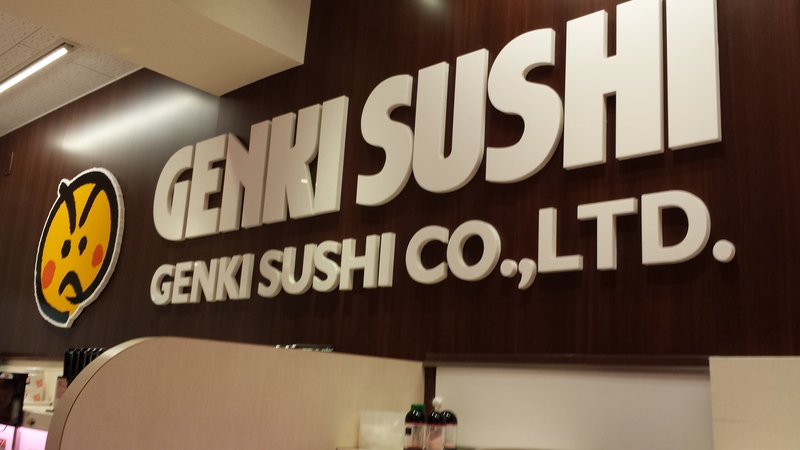 Genki Sushi is actually a chain of restaurants with locations all over Japan, Singapore, and the USA, among others. 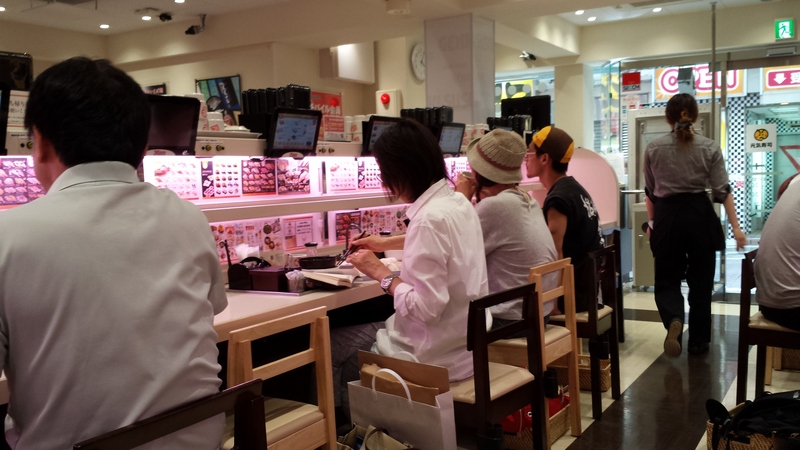 The basic idea is the same as your typical kaiten zushi, only you place your orders through an iPad. 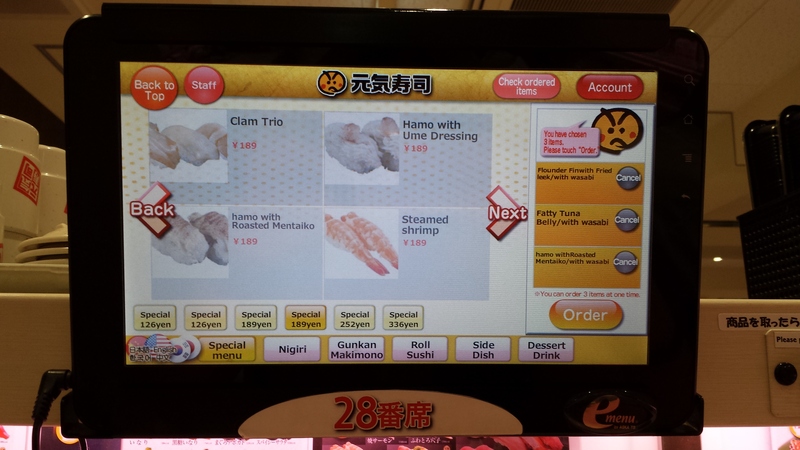 The menu comes in various languages, including English. You can order three items at a time, which arrive speedily on these tracks moments after you place your request.